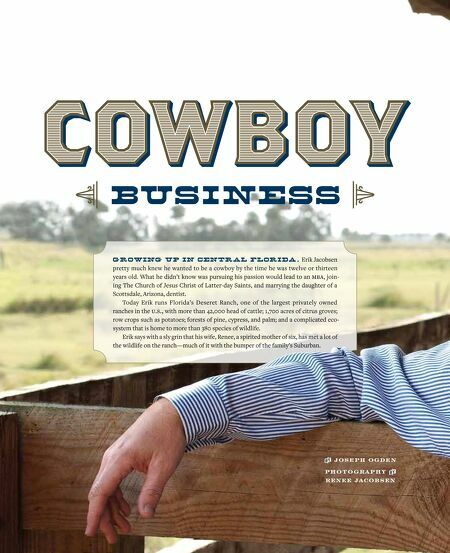 Cowboy Business By Joseph Ogden Photography by Renee Jacobsen Erik Jacobsen MBA, 1990 Growing up in Central Florida, Erik Jacobsen pretty much knew he wanted to be a cowboy by the time he was twelve or thirteen years old. What he didn’t know was pursuing his passion would lead to an MBA, joining The Church of Jesus Christ of Latter-day Saints, and marrying the daughter of a Scottsdale, Arizona, dentist. 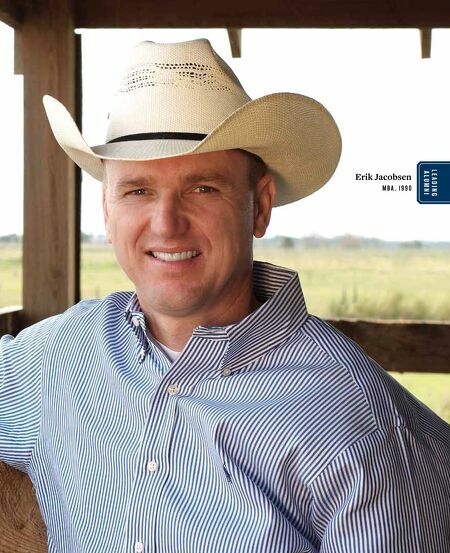 Today Erik runs Florida’s Deseret Ranch, one of the largest privately owned ranches in the U.S., with more than 42,000 head of cattle; 1,700 acres of citrus groves; row crops such as potatoes; forests of pine, cypress, and palm; and a complicated ecosystem that is home to more than 380 species of wildlife. Erik says with a sly grin that his wife, Renee, a spirited mother of six, has met a lot of the wildlife on the ranchmuch of it with the bumper of the family’s Suburban.